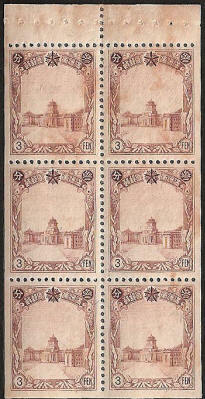 This set has been redrawn and engraved (with many variations) on watermarked (see below) "granite" paper. 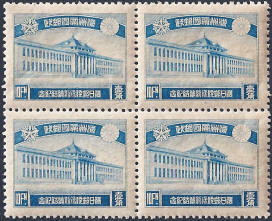 The stamps were produced in sheets of 100 by the Central Bank of Manchukuo Printing Department in Hsinking. 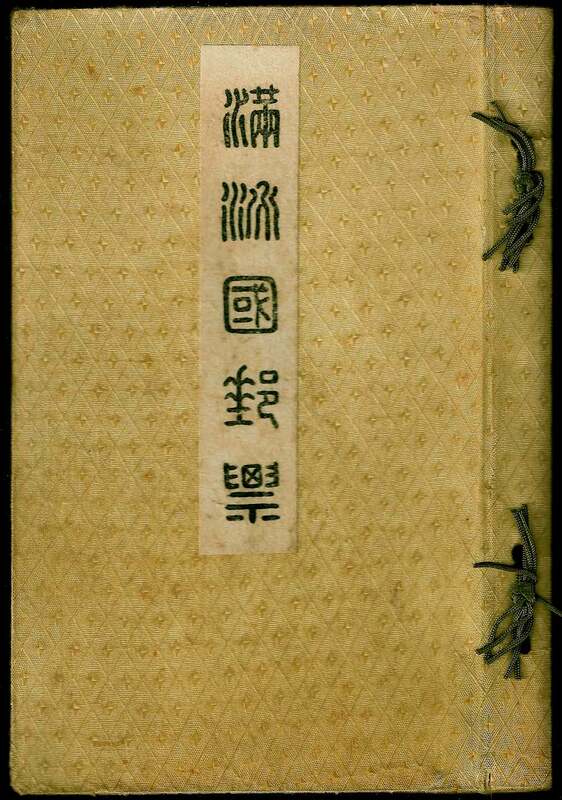 Designer unknown. 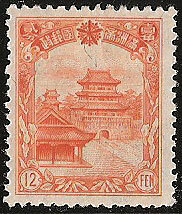 Produced at different times throughout 1936 as old plates wore out and had to be replaced, this is the third printing. 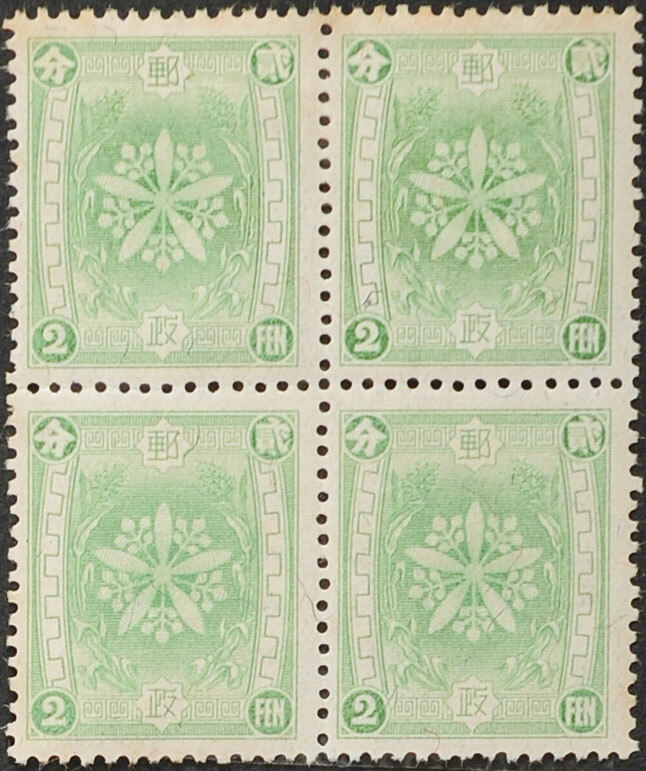 Note that the 2f stamp can be readily found in two shade, yellow green and light green. 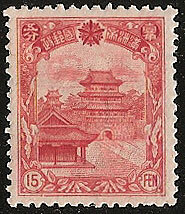 This is seldom mentioned in catalogues. 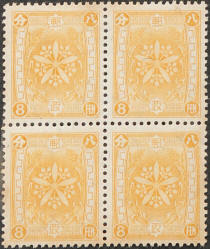 The stamps are 18.5mm x 22mm, Perf 13½ x 13½. 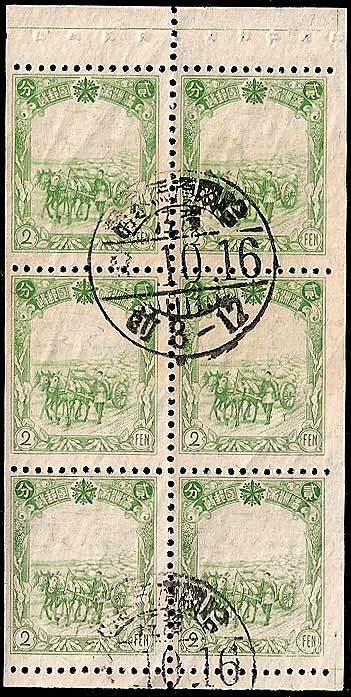 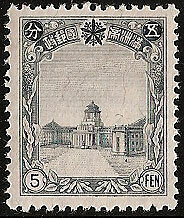 The set consisted of 4 stamps, 2f and 8f featuring the Imperial Crest of Manchukuo. 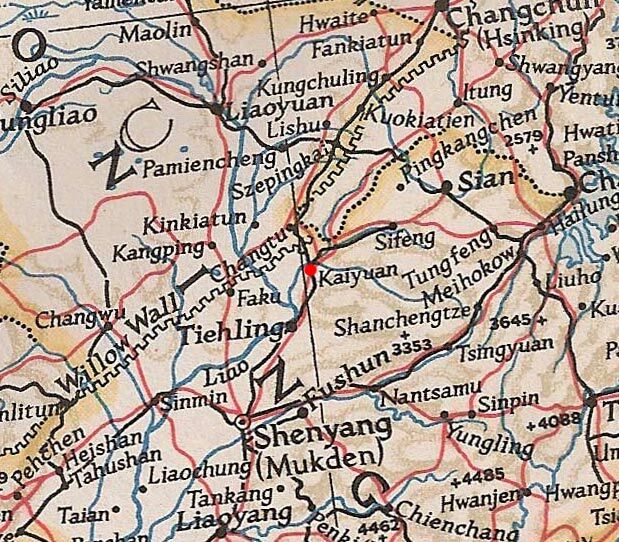 The 4f and 12f showing 長白山Zhǎngbáishān (Mount Changbai) and the Heavenly Lake, the birthplace of the Manchu dynasty. 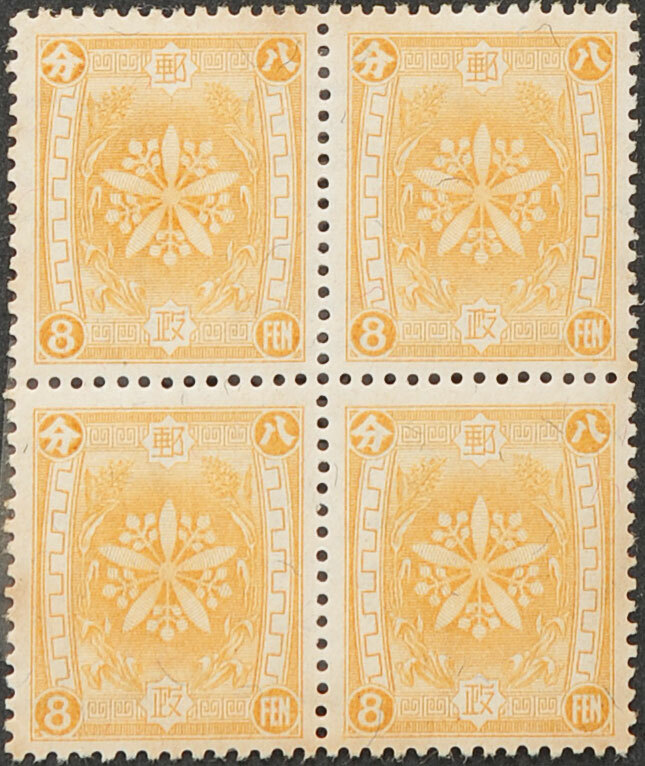 This is a commemorative issue celebrating the postal agreement with Japan signed on 26th December 1935 and implemented on 1st January 1936. 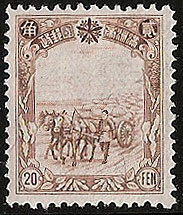 The stamps were issued on 26th January 1936. 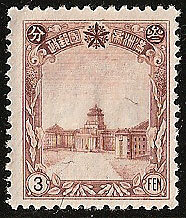 This agreement harmonised postal pricing between Japan and Manchukuo and prepared the ground for the phasing out of Japanese post offices in Manchukuo, a process which was complete by 1937. 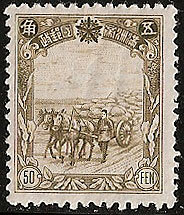 Prior to this agreement the postal arrangements between Manchukuo and Japan had to conform to the Sino-Japanese Postal Agreement of 1911. A commemorative cancel and presentation booklet exists for this issue (see below) and a special set of two picture postcards appeared for sale though Post Offices, these can be seen here. 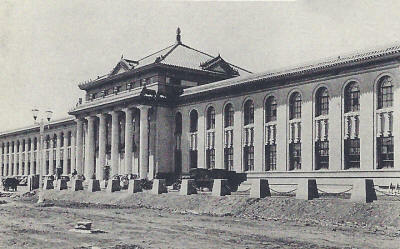 Ministry of Communication, Hsinking. 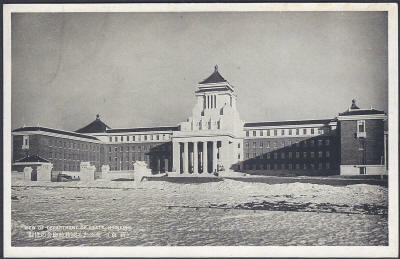 This ministry building held all of the bureau involved in communication; the Bureau of Posts, the Bureau of General Affairs, the Bureau of Transport and the Bureau of Navigation. 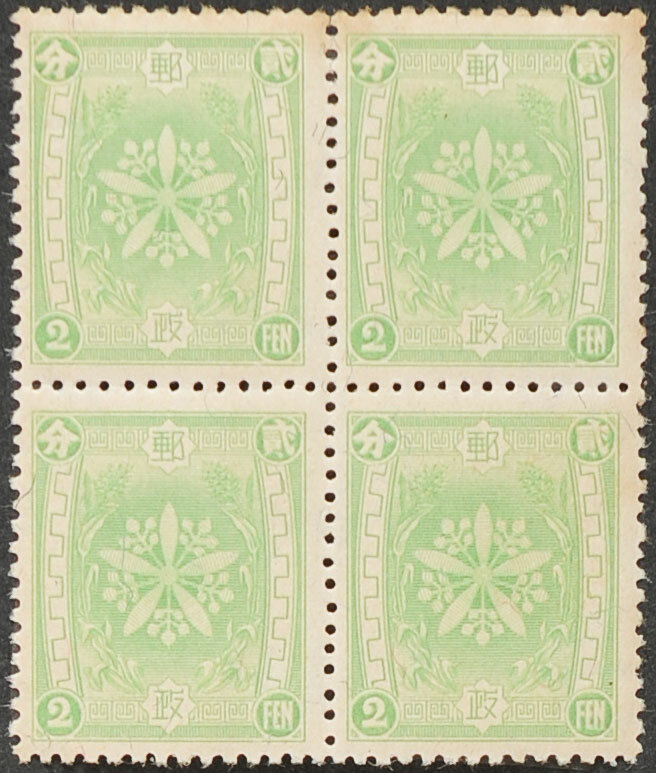 The stamps were recess printed on watermarked (see below) "granite" paper in sheets of 70 by the Central Bank of Manchukuo Printing Department in Hsinking. 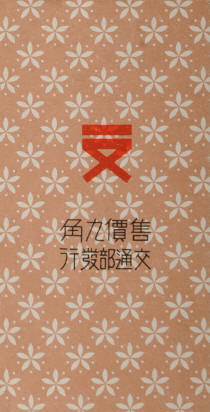 Designs by Mr Hirozo Oya. 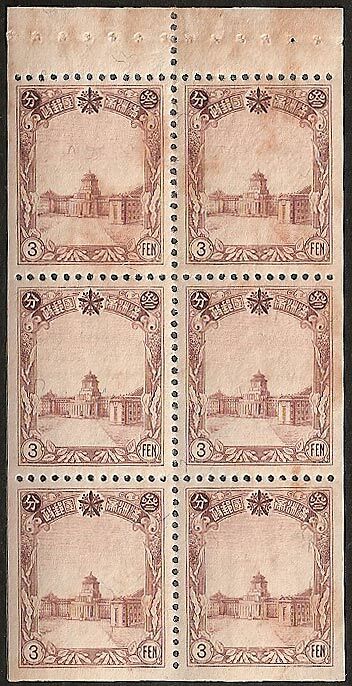 Proofs in the 3f exist in brown, imperf. 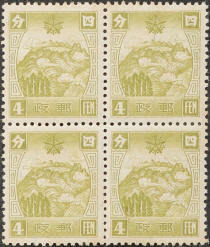 The stamps are 21.5mm x 27.5mm and 27mm x 21.5mm. 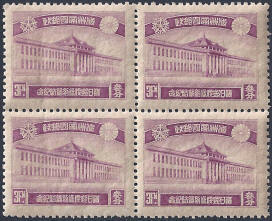 Perf 12 x 12½ and 12 1/4 x 12. 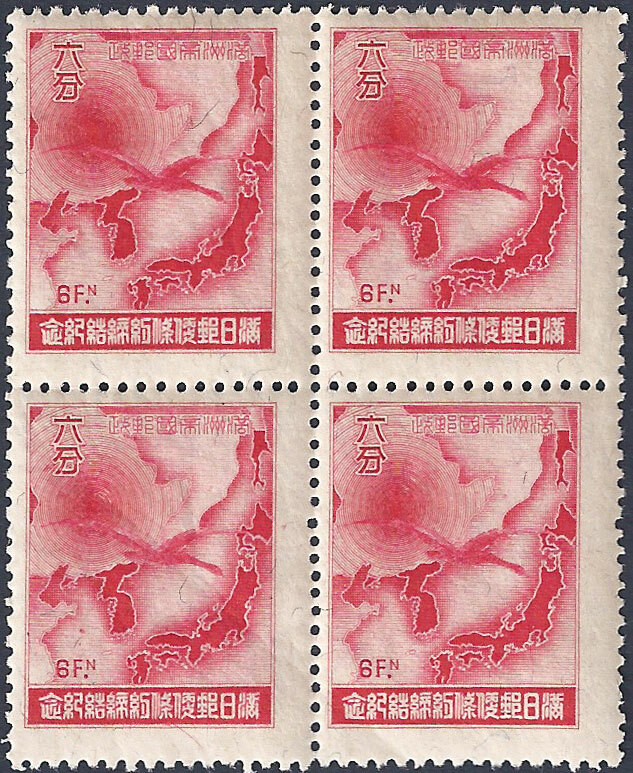 The 1½f and 6f shown Wild Geese flying toward Japan (a symbol of co-operation) and the 3f and 10f depict The Ministry of Communication, Hsinking. 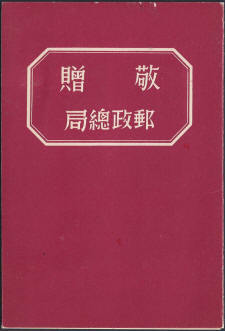 This example was issued in 龍井忖 Lungchingts'un. 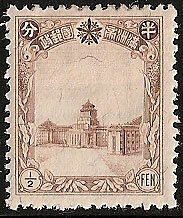 This is to celebrate the new postal treaty with Japan which came into effect on 26th January 1936. 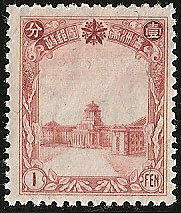 The central image is of a pigeon with a letter in its beak, flanked by the flags of Japan and Manchukuo. 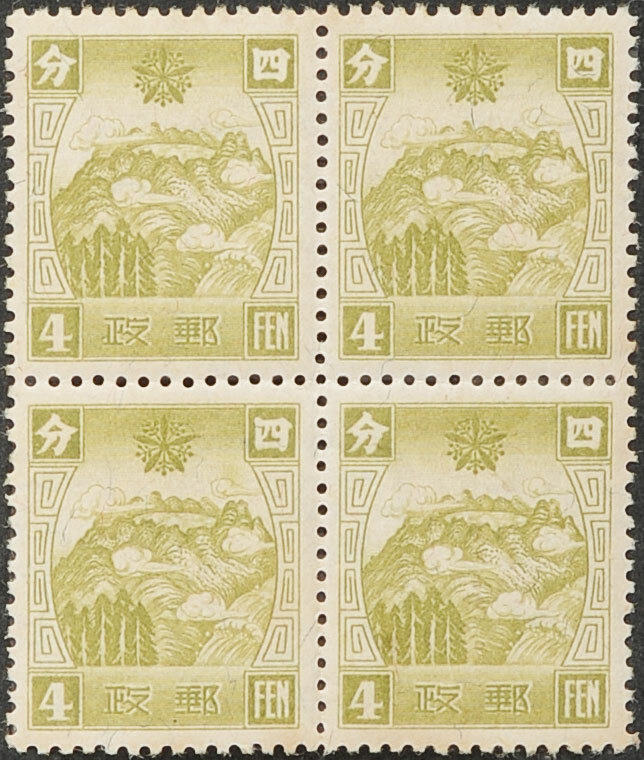 This issue, (excluding air mail designs which are similar) provided the basic postage stamps used in Manchukuo from 5th December 1936. 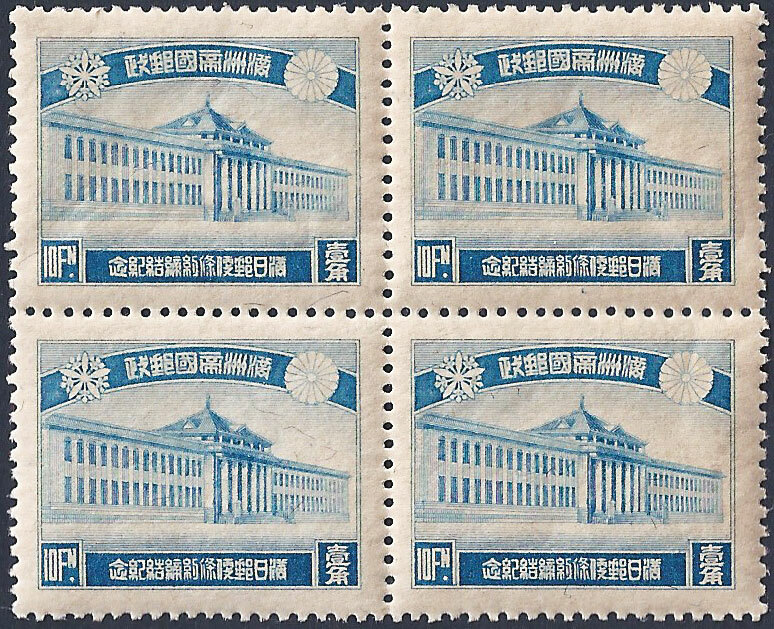 The stamps were recess printed on watermarked (see below) "granite" paper in sheets of 100 by the Manchukuo Government Supplies Division, Hsinking. 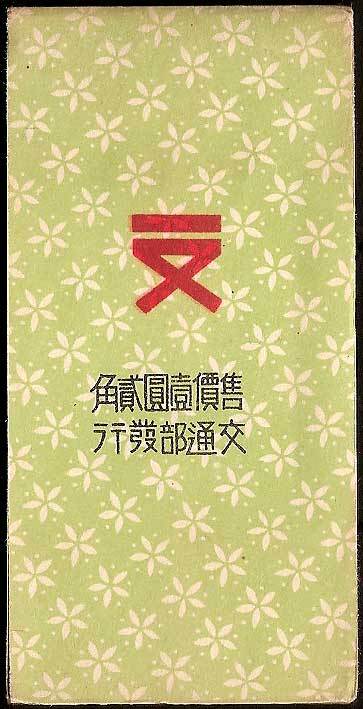 Designs by Mr Hirozo Oya. 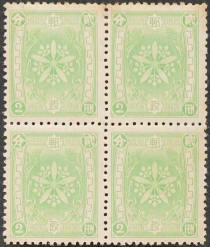 Stamps were printed in booklet form for the 1½f and 2f each containing 60 stamps in panes of 6, also 3f and 4f each containing 30 stamps in panes of 6. 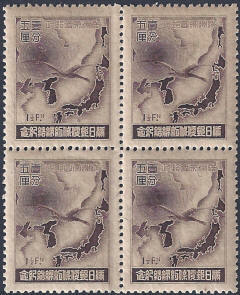 Stamps from booklet panes have one imperf edge. 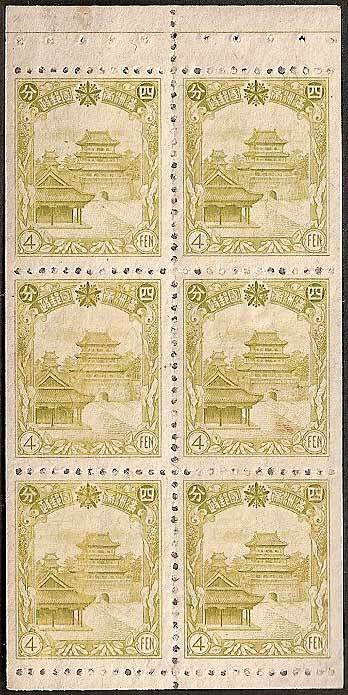 These stamps were re-printed in 1940 using a thinner paper and with some minor differences in shading and gum. 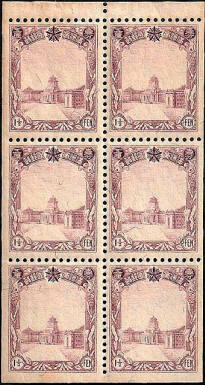 The total numbers printed are unknown for either issue. 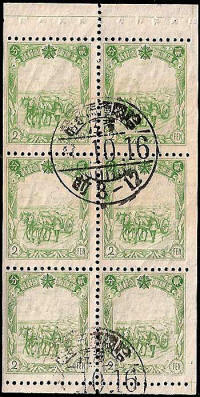 Very high numbers of these stamps were printed and so some degradation of the plates was inevitable. 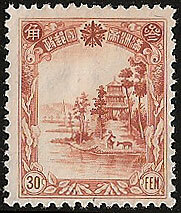 The most vulnerable part of the design was the orchid emblem at the top of every stamp. 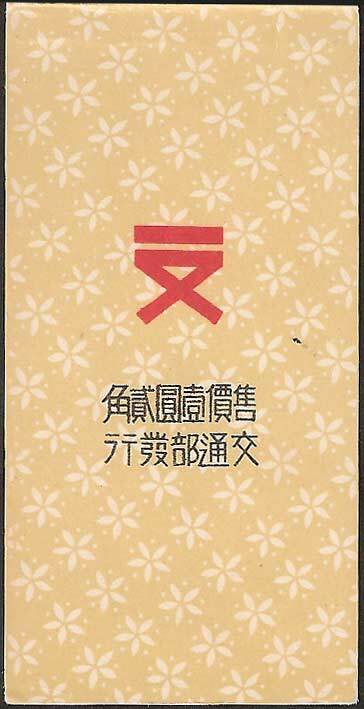 Wear to this part of the design gave rise to the so called "broken crest" varieties see below. 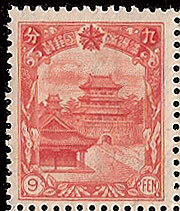 The "broken crest" has been found on the most widely used stamps, the 1f, 2f and 4f values. 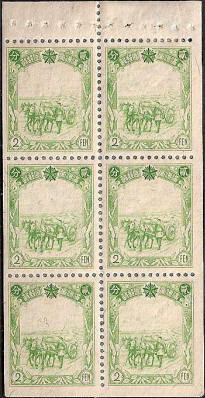 Sheet positions are inconsistent and these should be viewed as an interesting printing flaw and not a true variety. 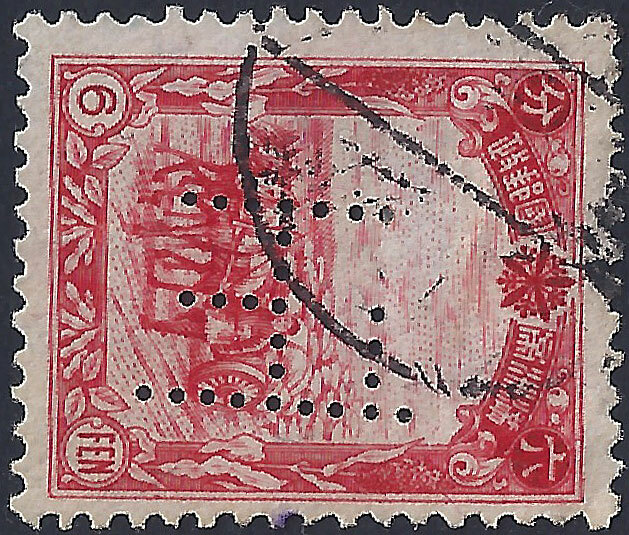 Suspicion of stolen stamps was raised in October 1938 by a Manchukuo specialist Mr L. R. Marr (in Osaka) when he was offered what he described as "altered" stamps by a Russian dealer. 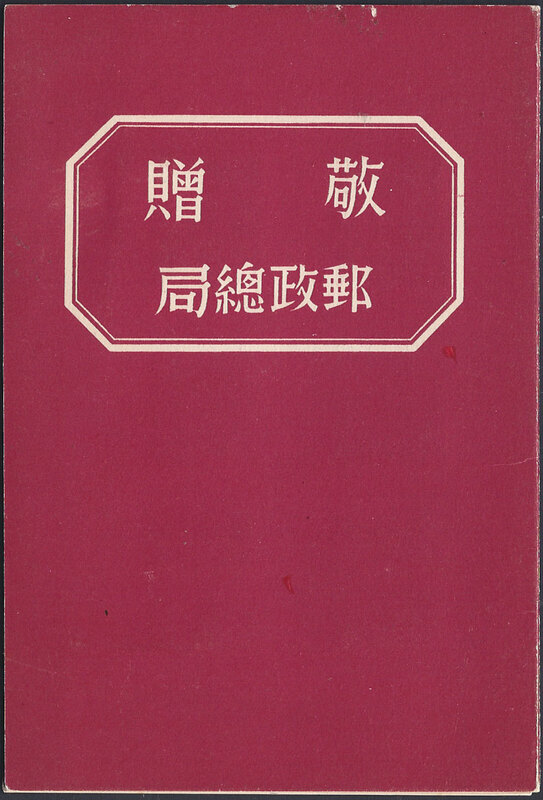 He wrote to Mr Ryutaro Nagai, Minister of Communications in Tokyo, voicing his concerns. 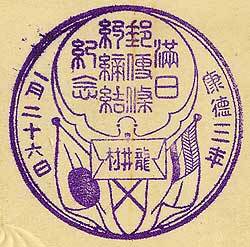 He told Mr Nagai that, as a result of his investigations, he had been informed that a Japanese man in Hsinking, by the name of Yamamoto, had a friend in the Manchukuo Government Printing Office, who was fraudulently altering stamps. 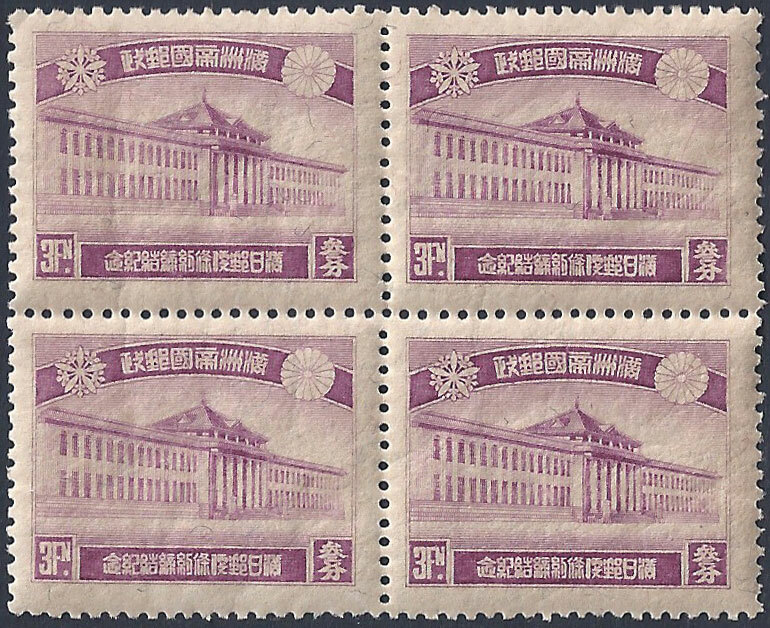 The subsequent investigation showed that an employee at the Government Printing Office in Hsinking had stolen both imperforate and diagonally perforated sheets of stamps for sale to dealers. 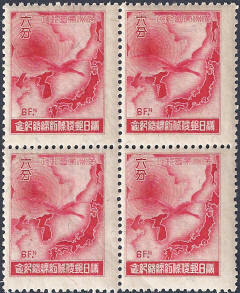 Four values are known to have been involved ½f, 1f, 2f and 4f. 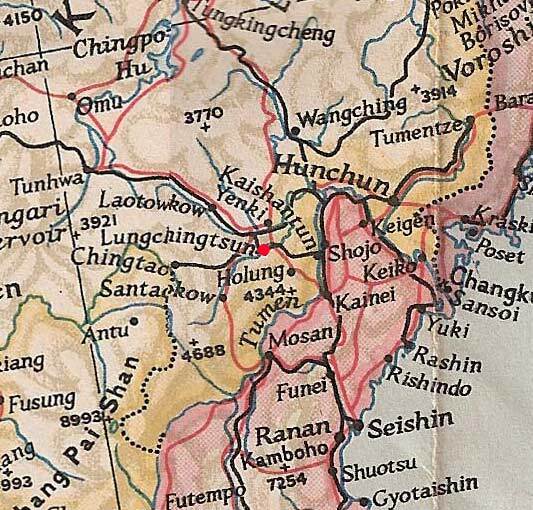 The culprit, and many outside accomplices, were quickly caught and severely punished. 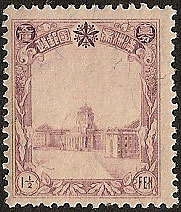 Most of the stamps were recovered, but some ½ fen were put on sale by the Harbin stamp dealer, A. S. Yaroshevitch. 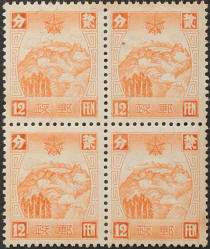 He sold them for $10.00 a pair, claiming that they had been bought by a student at a local Post Office. 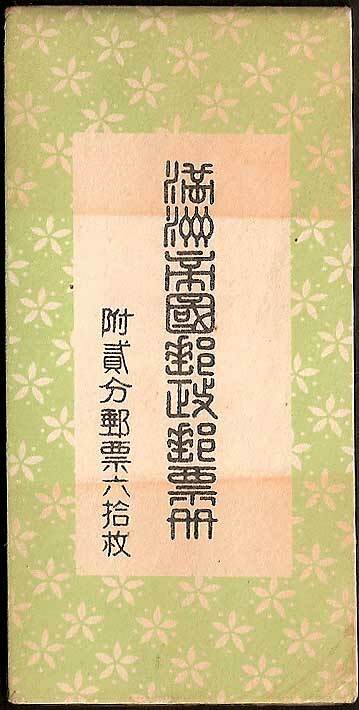 It is clear that he made this offer to most of the Manchukuo collectors on his books. 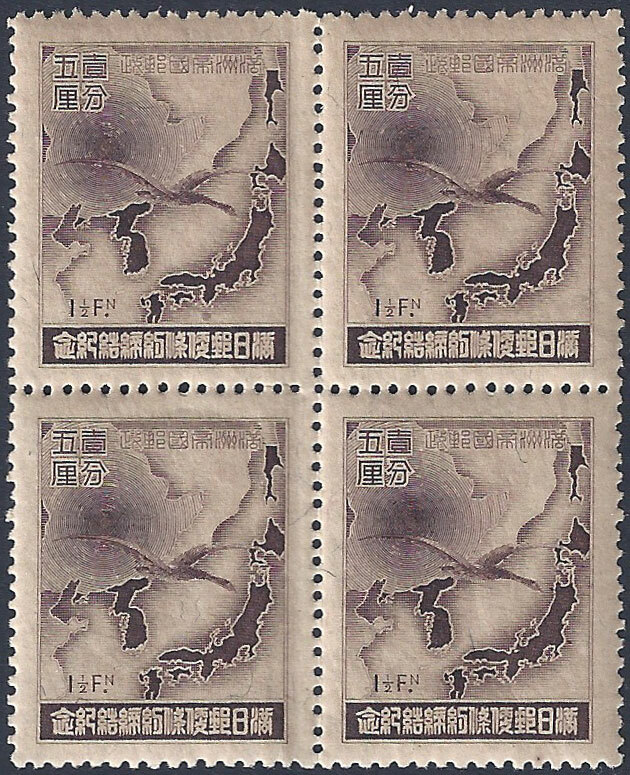 Akagi reports that some sheets found their way to America, but in all probability they were sent to collectors all over the world. 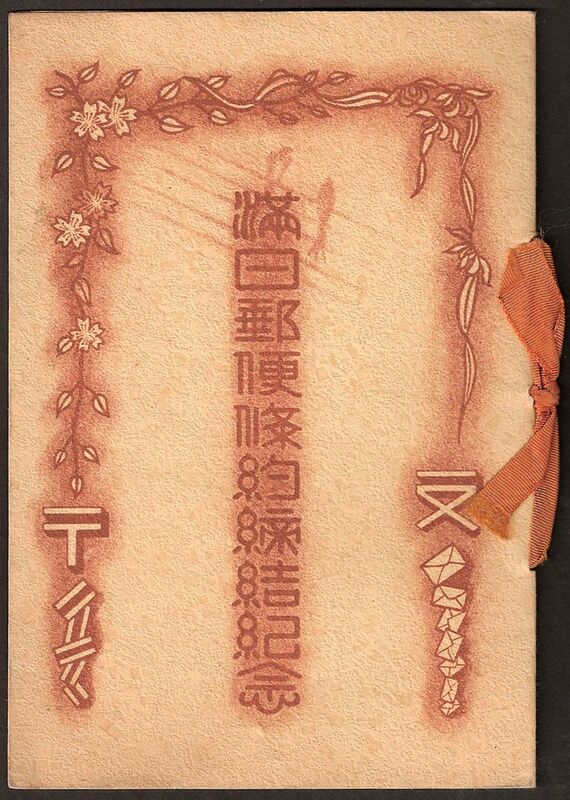 My thanks to Travis Searls for this image. 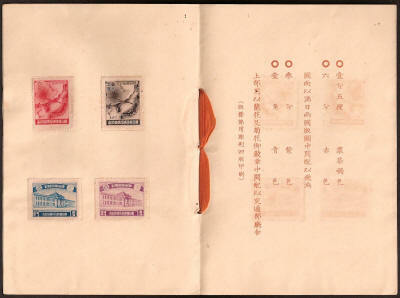 Booklets and Booklet Panes Issued 12th April 1937. 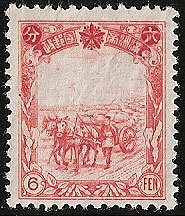 Issued 12th April 1937. 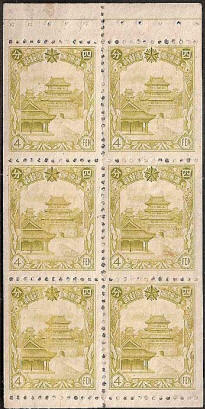 2f Booklet Panes - Type A unused and Type C - Used intact (Harbin 哈爾濱馬家溝 Ha-erh-pin Ma-chia-kou Postmark). 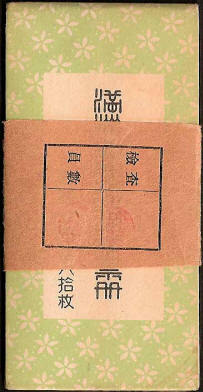 The used pane is a rare item because it shows all three types of guide line. 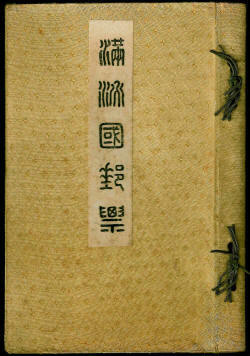 The Horizontal line for stitching plus the vertical and horizontal cropping guides (shown as a cross top and bottom). 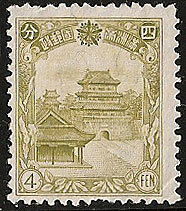 This item has been cancelled to order, the gum on the reverse side is intact. 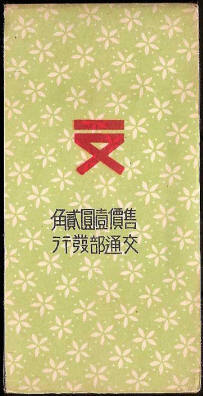 4f Booklet Panes types A. and C. Note that the second booklet pane has a thin horizontal line at the top to act a guide for stitching. 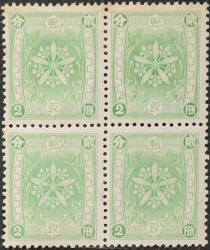 1937 Booklet Pane Perforations Type A. 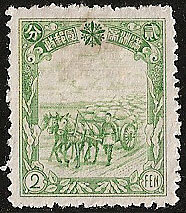 B. and C.
Issued 1st April 1937. 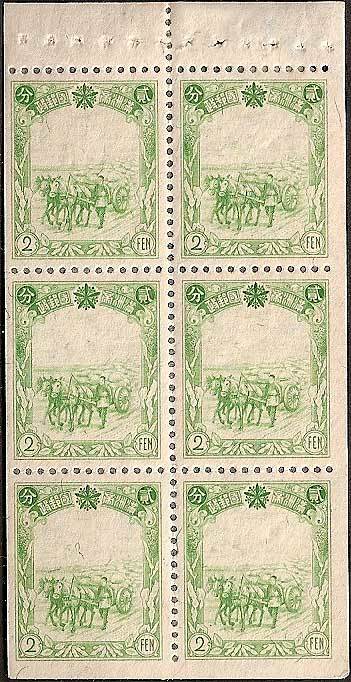 The 2f and 4f booklets were reprinted many times and there are three distinct patterns to the perforation at the bottom of the panes. 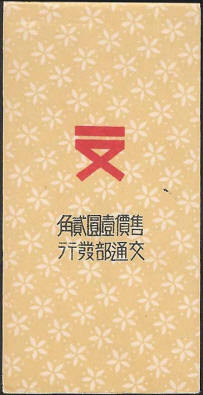 Type A. 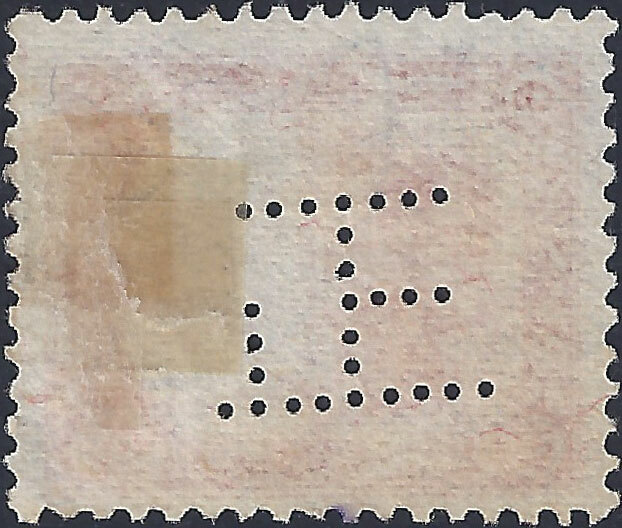 B. and C. (see below). 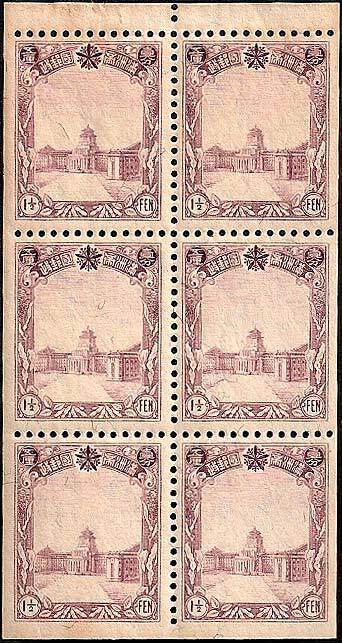 All booklets 1½f and 3f are identical and conform to pattern A, probably because they are all from the same batch, or batches of panes perforated at around the same time, these two values had a short life as prices increased in on 1st April 1937. 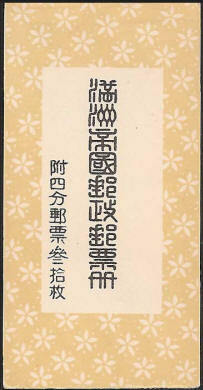 Front View, Front View with Retaining Band and Back View of the 2f Booklet. 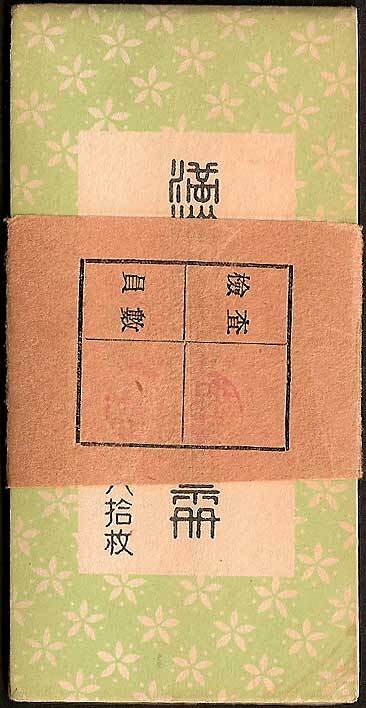 They look quite big on screen and when you see them advertised, what strikes you when you see the actual item is just how small it is. 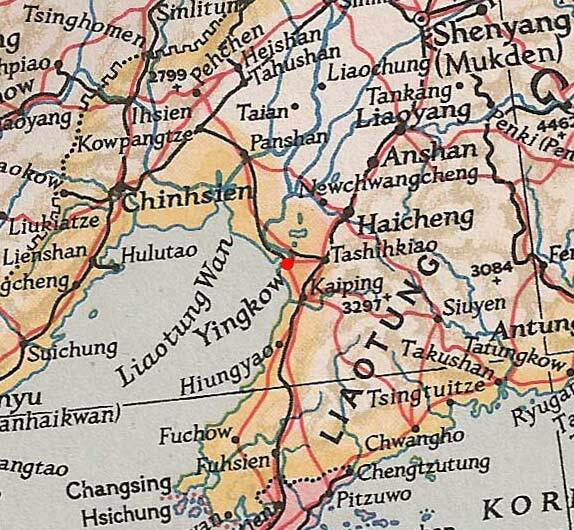 If you print off a copy you can appreciate this. 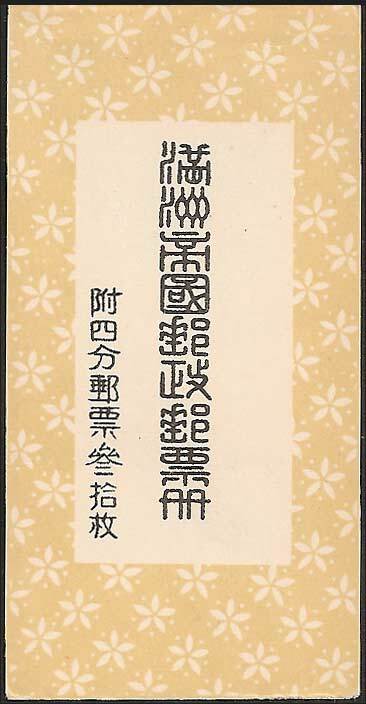 The actual size of the booklet is 44.25mm x 88.5mm x 1.6mm thick. 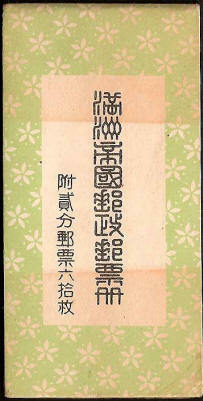 The central picture shows the booklet complete with the original inspection wrapper. 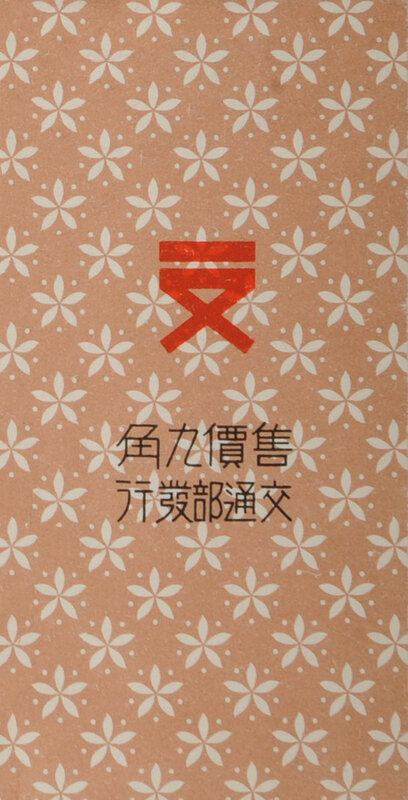 The two red chops show that each booklet has been checked by one official and the contents counted by another. 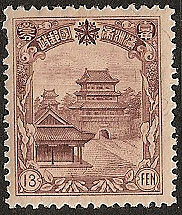 The Yokohama Specie Bank (now Bank of Tokyo) had a permit for the use of perfins in Manchukuo, these were primarily a security feature used to prevent staff pilferage of stamps. 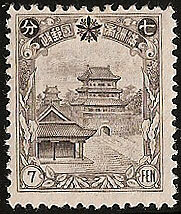 The 27 hole perfin shown above is in the shape of the first character of "Shōkin" 正金 the Japanese word for specie. 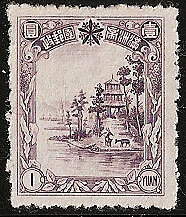 The Yokohama Specie Bank is known to have had offices in Kaiyuan, Hsinking, Mukden (2 branches), and Yingkou. 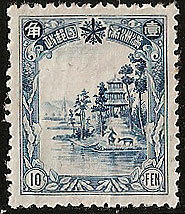 19 hole versions of this perfin are associated with branches in Japan and Dairen and these should only appear on Japanese stamps. 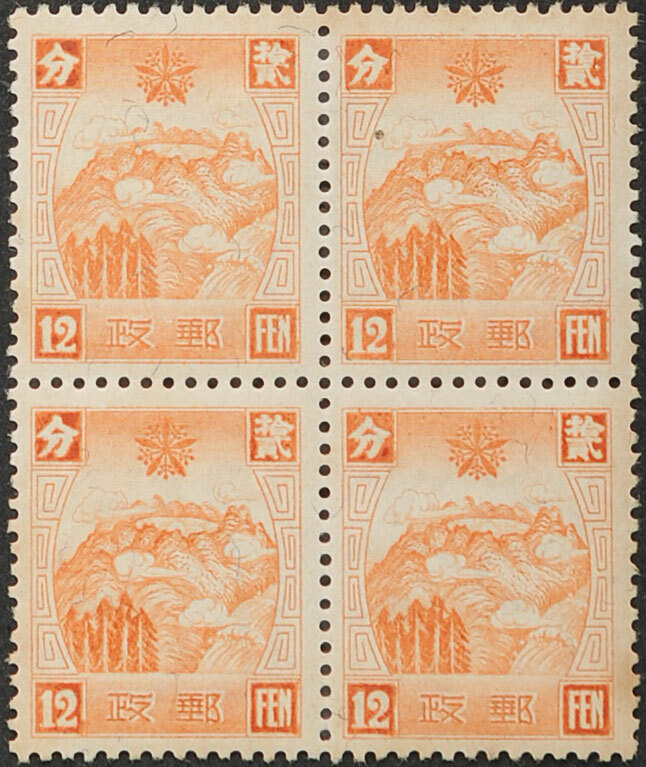 It is though the Album was issued in December 1936, the folder was probably issued toward the end of 1937 and contains some extra or substituted stamps. 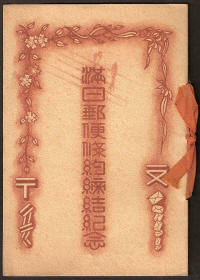 To find out more and view the contents click here.